‘The Little Traitor ’’ is light drama set in Palestine on the eve of the expiration of the British Mandate and the establishment, in 1948, of an Israeli state. The lightness feels wrong, but the writer and director, Lynn Roth, has no control over it, like a twitch or a jitter. Everything is as it should be even when it shouldn’t. 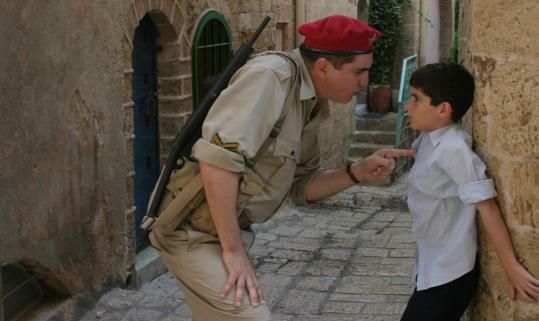 The movie is based on a 1995 Amos Oz novella, “A Panther in the Basement,’’ and tells the story of a friendship between a 12-year-old militant named Avi “Proffy’’ Liebowitz (Ido Port) and a British soldier named Stephen Dunlop (Alfred Molina). The Jews are skittish about the British, and the British are charged with enforcing a daily 6 p.m. curfew that Proffy, to the consternation of his Holocaust survivor parents (Rami Heuberger, Gilya Stern), habitually violates. Dunlop accosts Proffy as he races home during the curfew siren. He intends to arrest the boy, who says he’s not scared, and the older man drops the younger one off at home then invites him to visit at the British barracks. This is curious. It feels like the start of a romance — a socially unlikely, politically untenable, morally fraught one that Roth treats as the most natural thing in the world. Her movie isn’t glib so much as stultifying in its simplicity. Would that it were so easy. Walking Proffy home, inquiring after him, teaching him stuffy British modifiers (“indubitably’’), Dunlop is clearly smitten with the boy — not sexually, per se, but in every other way. Likewise for Proffy, whose complete nickname is “Professor.’’ He has fierce intelligence but no wisdom, which seems right for such a little person. But the movie doesn’t make up the difference. It wants us to find moving what these two have. The news of the mandate’s end, with Dunlop free to return to England, is treated as if Cary Grant is learning that he might never again see Deborah Kerr. A more psychological or personal movie (Oz was writing, in part, about his childhood) would have gone further with all the implications of the relationship. “The Little Traitor’’ is a history lesson instead. Everyone speaks with a weighted, fretful significance that both belies the movie’s chummy tone and showcases humanity, but is hell on character development. Port has been instructed to say his lines imperatively, with a precocious certitude. He’s a sweet child. But his performance is worse than cute — Proffy thinks he knows it all. Only Molina contributes the emotional variety a movie like this calls for. Otherwise, the bluntness works only when Proffy and two of his friends use it to explain the nail bomb they’ve built to help drive out the British. They’re little ideologues who loosely know what they’re doing. Their commitment to terrorism is fascinating, but whenever things get tense or dark, the score chirps up or the movie finds something to smile at. The mix of mawkishness and polemic is naive. Children, though, will probably leave with a lot of good questions. A better movie would leave them with more.